StuffPlug-NG 2.1, TB's popular plugin for Messenger Plus!, is out and the latest build (2.1.243) is now compatible with MSN Messenger 7.0.0632 too. Added since the previously posted 2.0 version are the languages (Dutch, French, Spanish, etc.) and a Custom Emoticons and Display Pictures Stealer. >> Download StuffPlug-NG 2.1 (for Messenger Plus!). Audiophiles using WinAmp may have noticed that the Toaster plugin was not compatible the MSN Messenger 7.0.0632 BETA released in private yesterday. But shaneh already made us a new version that shows the currently playing WinAmp song as your Personal Message in 7.0.0632 (NO support for 7.0.0604 in this one though). >> Download Toaster v0.72 (for MSN Messenger 7.0.0632). >> Download Toaster v0.7 RC3 (for MSN Messenger 7.0.0604). >> Download Foobar Plugin (for MSN Messenger 7.0.0632). >> Updated FAQ: Putting mp3 titles and artists in your Personal Message. OFF-TOPIC NOTE: I've received a couple of flames and remarks regarding the ultimatum to MSN I postulated a while ago and recently referred to again. For one last time: OF COURSE I was just kidding there! I'd be an arrogant fool to expect some result from it. Except for MSN Messenger Program Manager NicoleT, no Microsoft employee ever even visits Mess.be ;) No, seriously, we'll be waiting patiently and to be honest: the more BETAs, the better! BETA-testers from Belgium and The Netherlands can use this unofficial translation by PoTaToX to "Dutchify" the latest refresh 7.0.0632. The language file is now easier to install because of the automatic setup. Of course, like with any tweak, support is not available for this modified version. Other languages may follow. >> Download MSN Messenger 7.0632 Dutch Translation by PoTaToX. Discussing over MSN Messenger about who's going to cook dinner tonight? About who has to walk the dog or who's driving to that party? You know what? Let a good old school game of Rock, Paper, Scissors (RPS) decide: "RPS is a decision making game of wits, speed, dexterity and strategy between players who are unable to reach a decision using other means. The result of a game is considered a binding agreement between the players." 1) Download the Rock, Paper, Scissors emoticons straight into MSN Messenger 7 using our free CustoMess software and invite your friends to do the same. You can point them this way, or to the Download.com page. As soon as one of you plays, the other one has to follow within 5 seconds. 3) The chosen weapon will appear after the countdown. I suppose everybody knows the rules, but just to make sure: rock breaks scissors, scissors cut paper and paper beats rock. When two identical symbols are revealed, it's a tie. Usually people play best out of three, but make sure you pre-determine the (odd) number of rounds required to win. 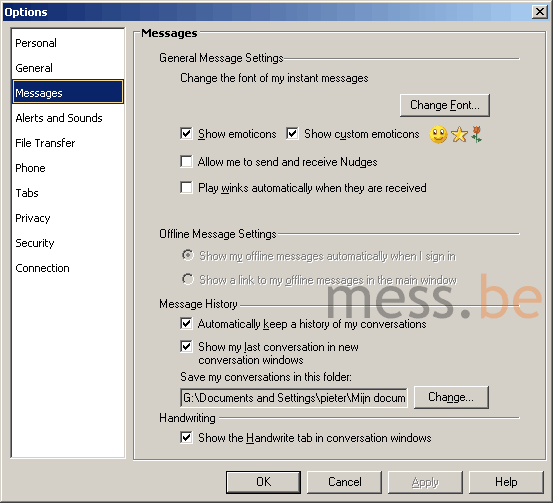 >> Download CustoMess for MSN Messenger 7 (updated: RC2). >> Read our Rock Paper Scissor for MSN Messenger page. >> Download MSN Messenger 7 PUBLIC BETA. A new build of MSN Messenger 7 has been sent to BETA-testers just moments ago. UPDATE: One noticable change is the new Audio icon in conversation windows. And a mouseover on the contact list shows a conctact's display name and e-mail again. Apart from those, this non-public build 7.0.632 looks no different than the leaked 604 build. - Winks from 7.0.632 can only be sent to another build 7.0.632. The leaked build (7.0.604) and the public beta (7.0.425) cannot receive winks from the latest BETA (this will be fixed in the refresh). Issues may be experienced with Winks if the installed version of Macromedia Flash is not up to date. - New MSN Mobile features such as sending a text message to a contact from your mobile phone or Offline Messaging will not be immediately available. - The MSN Messenger BETA build will not be added to major firewall provider safelists and may cause firewall software to display a security error. - Full-screen Video Conversations may crash on Windows 98. - Installation of the BETA version on Windows Media Center Edition is not supported. - It is recommended that Windows 98 and Windows ME users upgrade to Internet Explorer 6.0 before running the new BETA. - Some international character sets or "Double Byte Character Sets" may overlap or cause the font and/or font size to change. - The "Customer Experience Improvement Program" menu item under Help may be inactive. To get around this, please click on Tools > Options > General. - When signing in as anything but "Online", the ad in the main window is not clickable. As usual, more details and patches will follow! Depending on where you live, you will have been prompted today upon signing in with a message telling you can now "Add a mobile contact by using a phone number". After entering someone's mobile number (no need for a Passport account anymore!) and an optional nickname, you must purchase Mobile Messages (via you browser on the MSN Premium Services website) before you can start chatting away. Contacts who receive instant messages on their mobile devices may be required to pay a fee, depending on their wireless service provider. So if you're a poor chat-a-holic, this service is not for you. Your mobile contacts on the other hand, can send you messages even when you are not signed in to MSN Messenger. These are referred to as "Offline Messages". The first time you receive an offline message, you can choose how you want to view these messages in the future. However, you can change this option at any time under Tools > Options > Messages. This is not exactly the kind of Offline Messaging we hoped for, because only mobile contacts can send offline messages. Your virtual answering machine is not accepting messages from regular MSN Messenger contacts, like in ICQ for instance. I guess MSN was obligated to add this feature because otherwise if mobile contacts would send you an IM while you were offline, the message would go lost and they'd still have to pay for it. And if you send a message to a mobile device that is offline, it'll be safely delivered the next time that device is online. For the record, contacts with a mobile status have a yellow contact icon ( ) next to their names. However, some mobile contacts may appear as a green contact icon ( ) when their mobile device is online, or as a red contact icon ( ) when their mobile device is offline. Depending on your contact's language, mobile device and wireless service provider, you may not be able to send messages with more than 70 characters. MSN Messenger will notify you if you send a message that exceeds the limit for that contact. Mobile contacts that allow only SMS messaging cannot send or receive emoticons. However, mobile contacts whose wireless service providers allow EMS (Enhanced Mobile Messaging) have a choice of six different emoticons that they can send or receive. The mobile conversation window automatically displays emoticons if they are allowed by your contact's wireless service provider and mobile device. UPDATE: Messer Pedro pointed us to the alternative option to get Offline Messages delivered to your e-mail. Just select 'Other' as Company, and enter your e-mail! We previously reported about three new MSN Messenger activities "coming to a Messenger near you", but quite often they failed to launch, especially simultaneously on both sides of the conversation window. It seems like things have stablized now and we invite you again to give Mah Jong Tiles, 7 Hand Poker and The Conversationator a go. 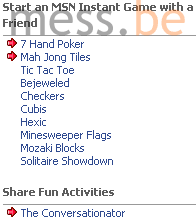 Those of you who can not find them in their MSN Messenger "Games" menu should use our handy MSN Games Launcher. >> View: Sprite-branded The Conversationator screenshot. Hitch, "Hollywood's most acceptable date movie in a while" according to USA Today, stars Will Smith in the title role of a "date doctor". The romantic movie is being marketed through MSN Messenger in the form of official conversation window backgrounds and even an MSN Messenger-mimicking web-based bot that gives you dating advice and teaches you how to answer to women's tricky questions. >> Browse our Hitch MSN Display Pictures. >> Browse our 3279 Movies Display Pics. >> Official Hitch backgrounds here. >> Catch the movies' worldwide release dates. I have 4438 new e-mails and the sun will shine between an occasional snow shower. That's what my personal and first-ever new MSN Today popup told me this morning when I logged into MSN Messenger, and it's not lying. But this means the worldwide MSN Today makeover has entered Phase 2 and will present itself to MSN Messenger users from Belgium, Brazil, Denmark, France, Germany, Italy, Korea, Mexico, The Netherlands, Norway, Spain, Sweden, Taiwan, UK and Latin America. The final Phase 3, which will affect another series of countries, has not yet set in. 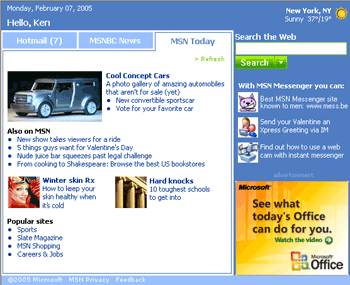 >> Read: "MSN Today" Improvements in Three Phases. >> Read: The new MSN Today, today! (What's New?). >> View: MSN Today (US) screenshot. >> FAQ: Can I stop the MSN Today popup? (or reverse the instructions to enable it). EXCLUSIVE: Messenger Contact List Size Limit to be doubled! Who'd have thought we are actually going to get most of what we demanded in our sneering ultimatum to Microsoft last month? - Personalized Status Messages: CHECK. - Dynamic Display Pictures: SOON. - Contact List MSN Display Picture Thumbnails: CHECK. - And finally, a larger Contact List capacity: SOON! That's right! There were some false rumors earlier, but today we can reveal that the limit on your Windows or MSN Messenger Contact List -currently set at 150- will be DOUBLED. Go and start finding some new friends, because this means you'll be able to add and observe the statuses of a total of 300 contacts per Messenger account. The increase will be carried through together with the official and final release of MSN Messenger 7, scheduled for April. Nanaca†Crash is a Yeti Sports-inspired Flash game based on the characters from a PC game called Cross†Channel. I normally don't post these things here (rather at my blog) but I've been playing this damn game far too long and now it's your turn to get addicted! Living in Australia and feeling lucky? Then start telling friends & family about MSN Messenger using this form and you will be in with a chance to win one of six Xbox Live prize bundles! You can send to as many people as you want, but as soon as one of them downloads MSN Messenger you will receive your one and only entry, which will be included in the weekly as well as all subsequent prize draws. There are 5 weekly draws each with its own great prize of an Xbox Live starter kit, and one copy of each of the following Xbox games: Halo 2, Fable, Ninja Gaiden, Rallysport Challenge2, Project Gotham2 and Sudeki. Every entry, including weekly prize winner entries, will also be included in the grand prize draw on April 20th, to award an Xbox Video Game System AUST/NZ Hrdwr PAL Cntrl S, an Xbox Live starter kit, and the same games mentioned above. >> Go to the official Xbox Competition homepage (Australians only). >> Find Xbox consoles, games and accessoires on eBay. 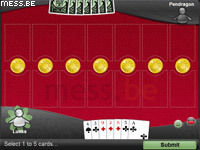 >> Browse our 1077 Games MSN Display Pictures. Thanks to a tip from Justin "BlackICE" we found out about two new official MSN Messenger games and something that goes by the fear-inducing name of The Conversationator. With 7 Hand Poker you can thumb-wrestle play poker with 3-headed monkeys, or your friends (if your name is Timothy those are your friends). 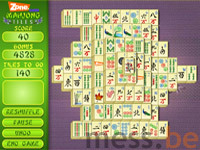 Mah Jong Tiles on the other hand, ports the classic Chinese puzzle game to MSN Messenger. And the The Conversationator? That's supposed to be a Sprite-branded MSN Messenger activity that enables audio chatting with "sound clips, backgrounds, display pictures and emoticons from exciting Miles Thirst". Yes, we are now officially terrified. Timothy's gang of three-headed monkeys is trying to make screenshots, but we have problems launching the new games. Maybe you can give it a try using our MSN Games Launcher? If unsuccesful, they might have still been disabled for now. Who needs a multimillion dollar television studio? Using nothing more than a laptop with a Logitech webcam, a storage box, a phone, a long ethernet cable, some lamps and our beloved MSN Messenger, Buzzmachine's Jeff Jarvis set up his own blogcast studio from which he commented on the Pope's emergency surgery LIVE on MSNBC's Connected: Coast to Coast. Like Jarvis blogged himself this proves that, thanks to MSN Messenger and a couple of everyday objects, anybody can broadcast from anywhere. You'd think the rather low image quality would discourage big television channels from airing webcasts, but rumors are MSNBC has already showed interest for more of Jarvis's home television. 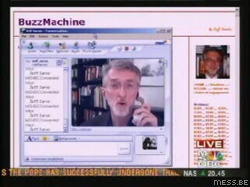 >> Watch video of MSN Messenger on MSNBC Live (thanks to Trey Jackson). Messer anonymousjon has informed us that, in addition to the previously uploaded Dutch translation, there is now also an unofficial French language file available for the leaked MSN Messenger 7.0.0604 BETA. Credit goes to Vautour013 who based his translation on the public 7.0.0425 BETA. >> Download the French translation for MSN Messenger 7.0.0604. >> Currently the only official and final French version is MSN Messenger 6.2. Last month we already exclusively revealed the coming of Emotion Sounds in the next version of Messenger Plus!. Today we can tell you that Patchou has managed to add another very useful feature aimed at poor, helpless Plus! virgins. The Configuration Wizard appears every first time an individual account goes online after Messenger Plus! 3.50 has been installed. A tutorial-like introduction in five steps gives users a brief explanation of what to expect from the addon and even allows a handful of noteworthy features to be configured immediately. Messenger Plus! 3.50, the first final version of Plus! to be compatible with MSN Messenger 7, is planned for release later this month. You'll hear about it first on Mess.be! >> Preview Messenger Plus! 3.50 Configuration Wizard (animated gif). >> Download Messenger Plus! v3.50. An apology to our 13487 Mess.be News Alerts subscribers for two inconveniences that occured last week. For several days, clicking a Mess.be News Alert would take you to a default website instead of here. This problem was resolved the 21st of February. Later that week, the LiveMessage service ran into another problem which caused alerts to be queued and not delivered on-the-fly. Some of you may have received a handful of alerts all at once afterwards. None of this was our fault and we've been assured both problems are now fixed. I'd also like to point out to the few people who complain that our alerts are being sent to their mobile phones, that the delivery preferences are entirely in your own hands. We suggest you have them delivered to MSN Messenger (and e-mail) only. In case you missed them you can always view alerts (received within the past 24 hours) under the golden bell tab in MSN Messenger. >> Join 13487 Messers and receive Mess.be News Alerts as it happens. America Online has released AIM Sync today, a free plugin that integrates AOL Instant Messenger's (AIM) buddy list into Microsoft Outlook (2002 and 2003). From Microsoft's popular e-mail client, you can see which AIM buddies are online and chat with them real time, similar to what was possible already with your Messenger contacts. AIM Sync allows you to add buddies from your Outlook contacts to your AIM Buddy List with just one click, and match up email addresses with AIM screen names in the AIM database. When you receive an e-mail from an AIM member who is online, a yellow "running man" logo appears in the "from" line next to the e-mail address. If you believe a quick chat session might be more appropriate in reply than a series of further e-mails back and forth, clicking on the logo launches the AIM software for you. This new Outlook-plugin, developed by Intellisync, is targetting corporate America, in which both Outlook and AIM are widespread. This move comes not long after Microsoft itself dramatically increased the level of integration of its own instant messenger into its Hotmail service. Skype, the free Internet telephony service, is getting a lot of press again lately so I decided to follow up on the Skype avatars posted last month and serve you the complete set of original Skype emoticons. >> Browse 42 Skype Emoticons. >> Browse 20 Skype Avatars. To be used in MSN Messenger of course! News.com reports that Bill Gates is expected to take the wraps off Istanbul, Microsoft's new Instant Messaging and real-time communications client, in a few weeks. Istanbul is an internal code name and the company has not said what the final program name will be, but it will be a "client of choice" replacement for Windows Messenger in a new version of the Office Live Communications Server (LCS). The software giant sent invitations to journalists and other insiders this week for a March 8 event in San Francisco, during which Gates will "unveil Microsoft's new and revolutionary real-time collaboration offerings." A spokesman said he couldn't specify that Istanbul would be the subject of the event, but the software has been widely touted as Microsoft's next major move in real-time communications and we've reported earlier that Istanbul is scheduled to ship in the first half of 2005. Istanbul goes beyond IM, though, handling a variety of functions based on "presence," the notion advocated by Microsoft and others of software being able to intelligently route communications among various applications and devices. For example, Istanbul reads calendar information from Outlook to decide whether an incoming call should go to someone's desktop or mobile phone. whoops, fixed the link madness! Starting Tuesday about two hundred thousand premium Hotmail customers have been experiencing slowdowns and the inability to log in or access certain e-mails. Brooke Richardson, MSN lead product manager, said the glitch was caused by a server problem but that the system was not attacked. No data was lost but some people were temporarily unable to access all their e-mails. By Friday, Richardson said the situation had "stabilized" but some customers were still experiencing slowness [including yours truly]. She said it wasn't yet clear when the situation would be completely resolved.